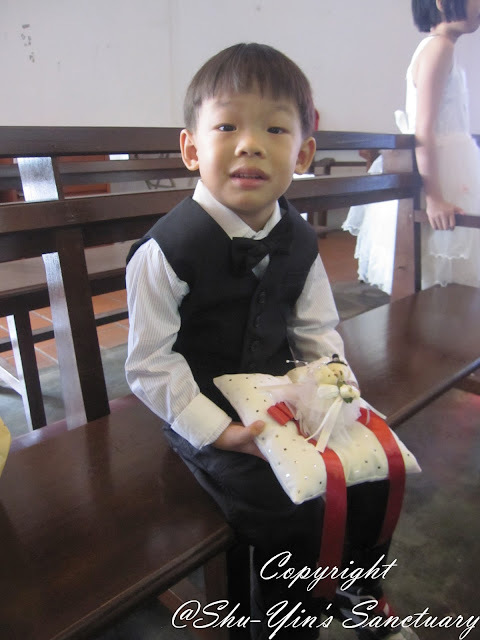 It was Chun Hoer & Pauline's Wedding last Saturday, and Shern was requested to be their Ring Bearer. 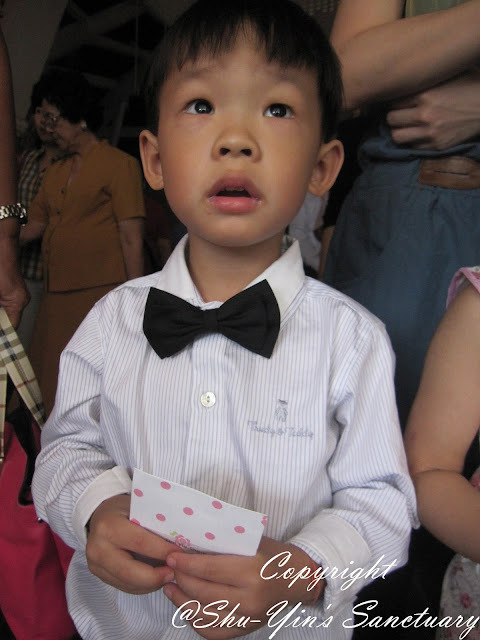 It was Shern's first time being a Ring Bearer! 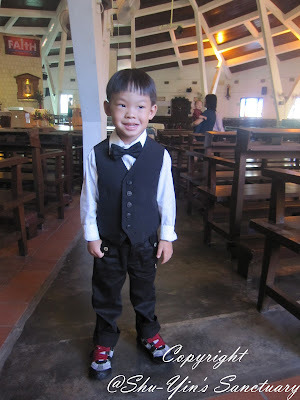 I had prepped him quite some weeks ago, and Shern was all excited playing the role as the Ring Bearer. 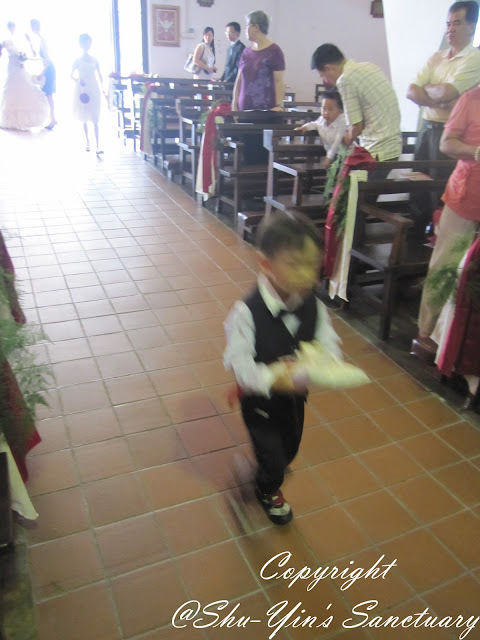 He felt important and was excited to walk the isle. But on the big day itself, Shern was a little nervous. We did not attend the rehearsal the night before, so we went early to get prepared. 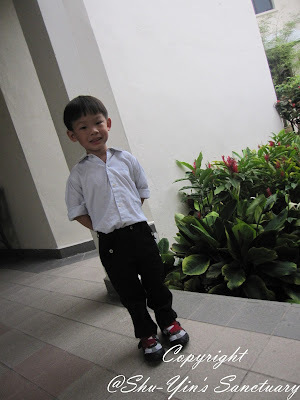 He was dressed smartly in a long-sleeved shirt, and black pants. He was also wearing a black vest with a black bow. Very smart indeed! 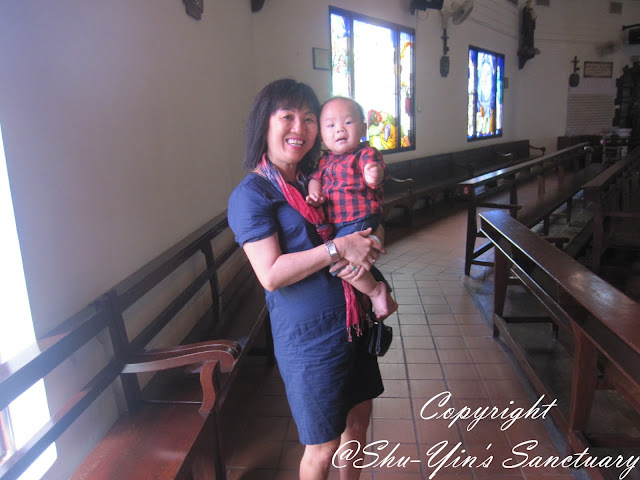 Pauline's sister, Viviene was the one who helped prepare Shern. She was very nice and friendly indeed. Shern liked her. 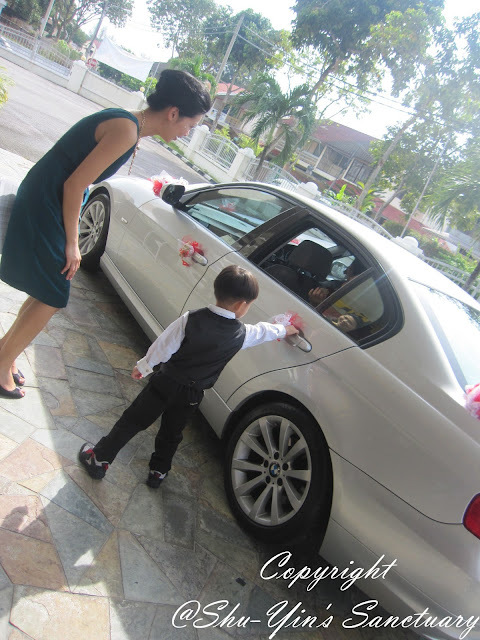 Shern with the flower girl. 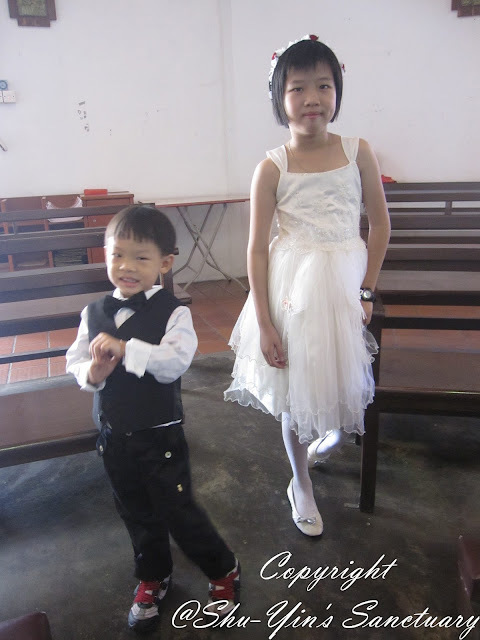 The flower girl is 10 yrs old, way bigger and taller than my tiny sized Shern. But after like 15 minutes of waiting, Shern got a little restless and couldn't wait to perform his role. And it was getting a little bit hot, as Shern was also wearing a few layers of clothes. And then, at 11am, the ceremony started. Shern walked in front, and he was happy to walk first. Number one, he said. 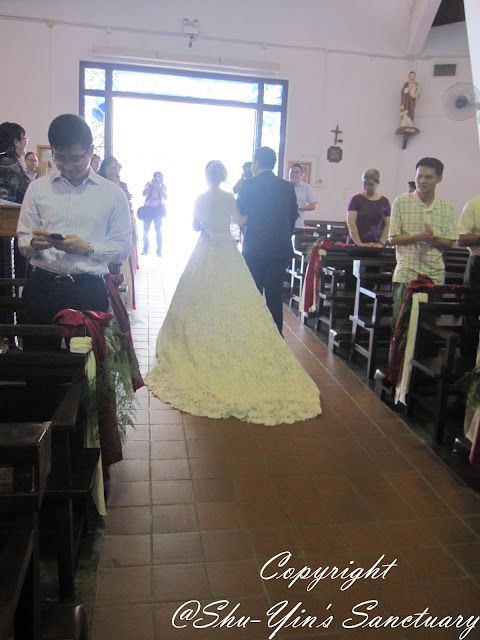 And then he was followed by the flower girl, and then the bride and groom. Sorry for the blurry photo. 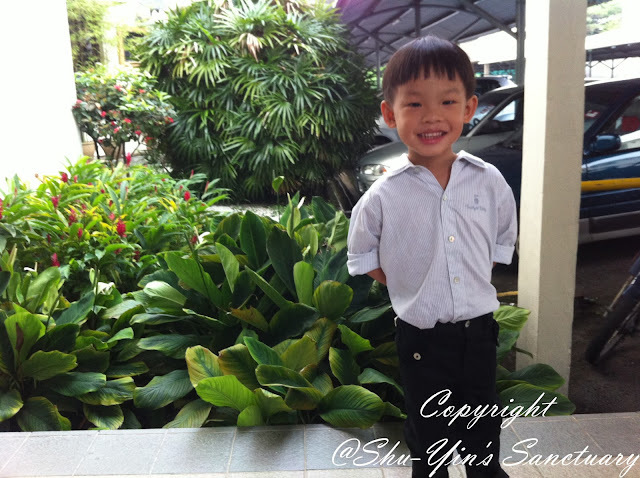 Shern was walking a little bit too fast (He just couldn't walk slow!). Shern was doing a good job. 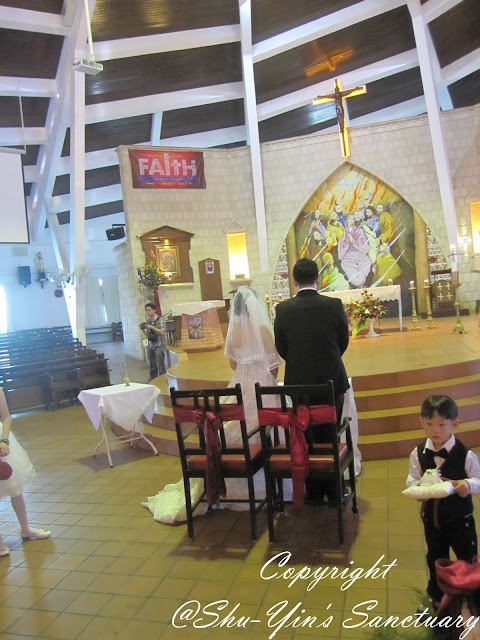 Walked down the isle alone (though a lil bit too fast! 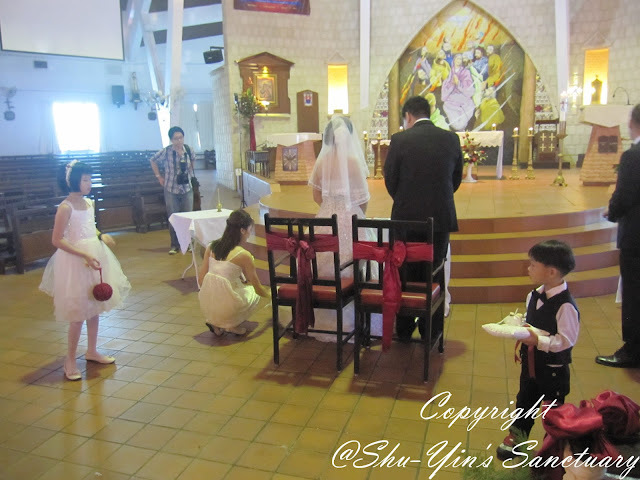 ), and stood at the groom's side as rehearsed earlier. Well done! 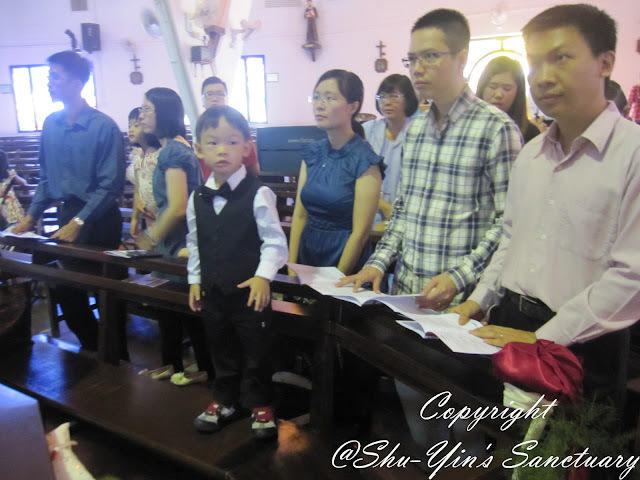 After that, he came to me and we continued with the whole ceremony. 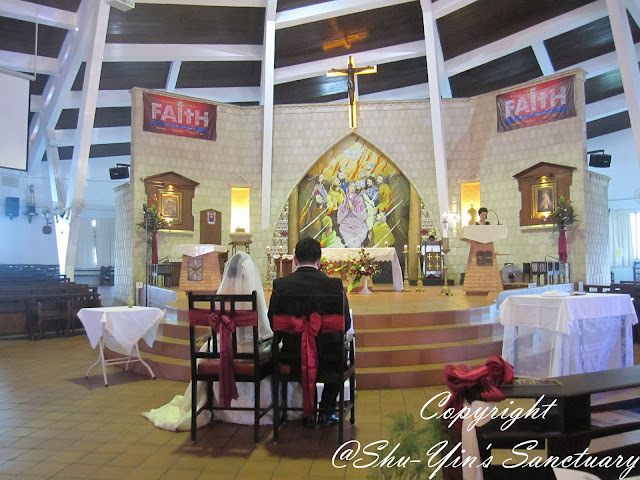 It was a sweet and simple church wedding. 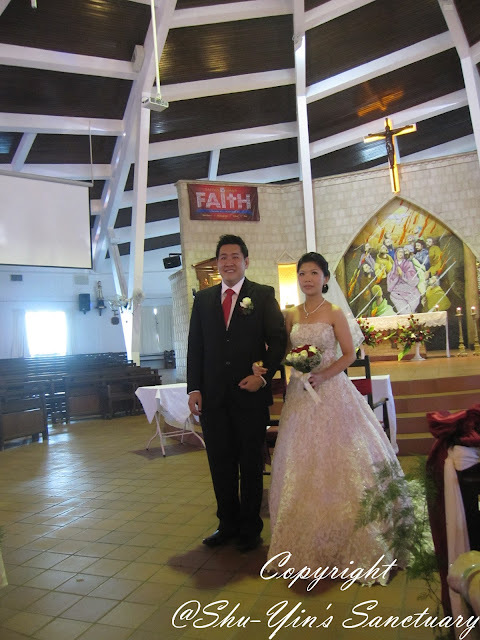 Chun Hoer & Pauline looked great! And Shern was given a small token of appreciation. Khye was there too. 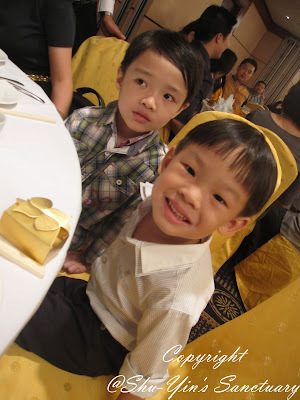 And I was glad mum tagged along, as she took care of Khye while I concentrated on Shern. Khye was sleeping half of the whole ceremony. Hehe. It's so nice being a baby, isn't it? 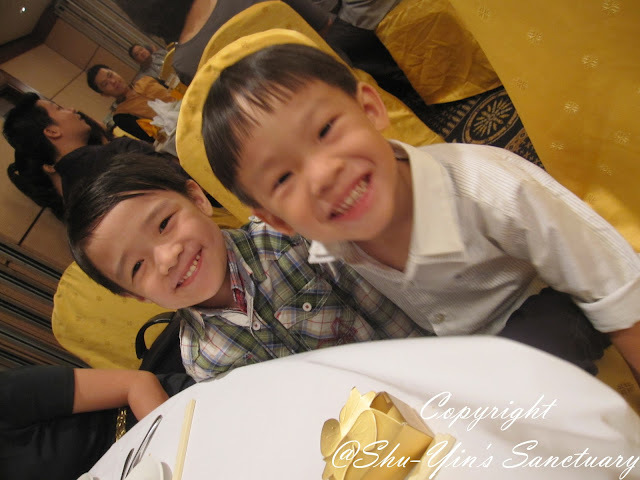 Shern was happy seeing his friends there, though he was getting a little tired. 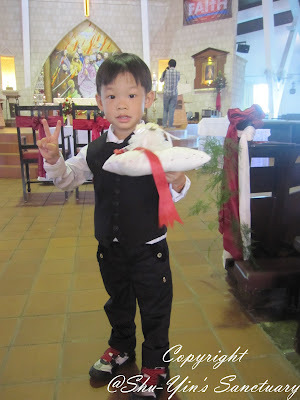 The kids had a good time running around the church, and when my mum asked him if he was feeling hot, Shern said 'Yes, I'm getting warmer and warmer and warmer!' lol. And it certainly didn't help that Shern was wearing long-sleeved shirt and long pants. 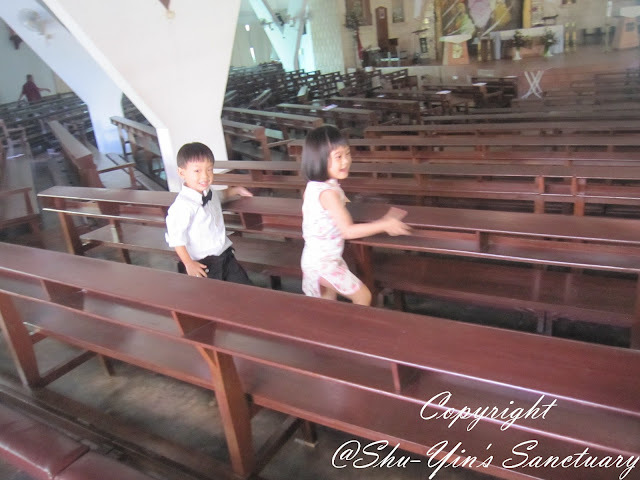 And also they turned off the aircond and fan immediately after the service. Bah. But we were all still waiting there to take photos with the bride and groom. Shern was sweating like crazy after the running round. 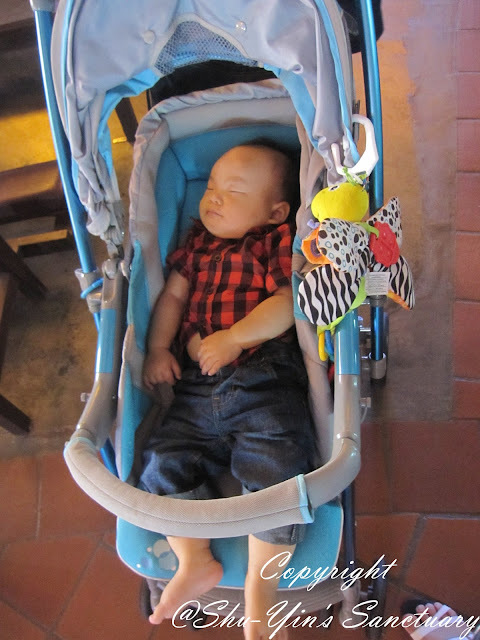 And when we proceeded for luncheon at the church cafeteria (the place was hot and stuffy), Shern was a little moody as he was hot and sleepy. So we left straightaway after the food. 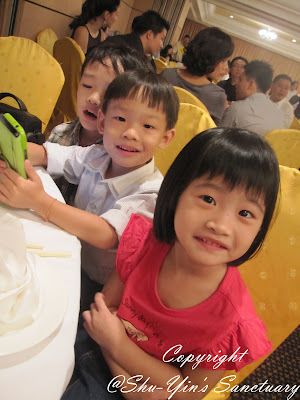 And after a good 2 1/2 hrs nap, Shern was all cheerful again, and was ready to attend their Wedding Dinner Reception at Gurney Hotel. 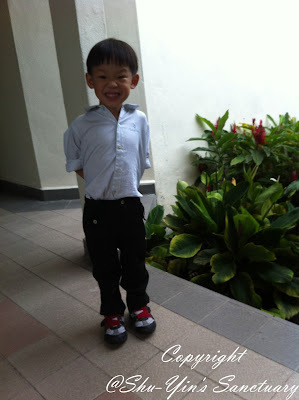 Shern looking all smart and happy when we were about to go for the dinner. 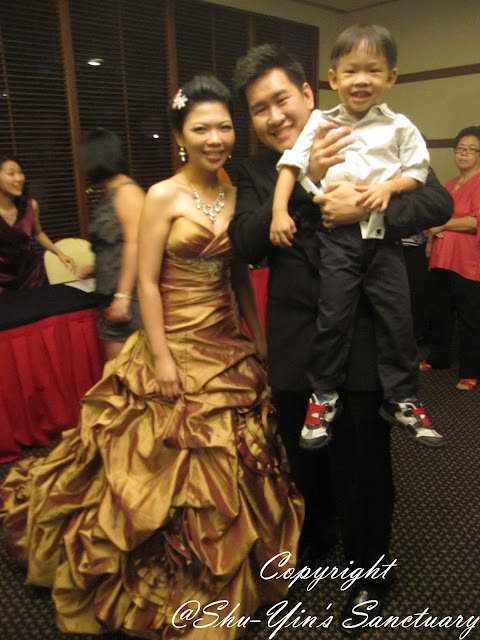 Shern took a photo with the bride and groom! 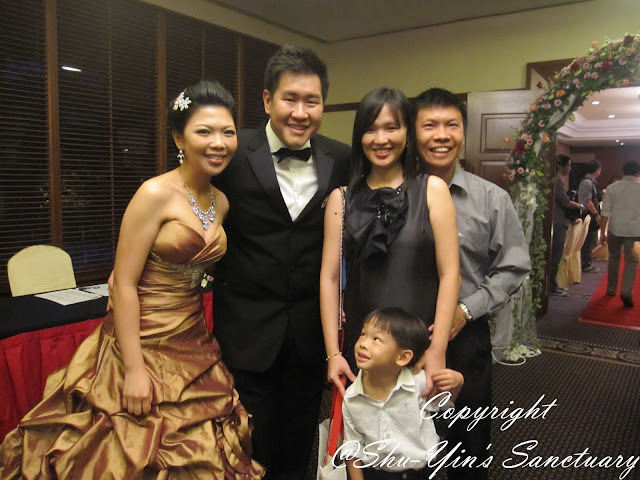 The 3 of us with Chun Hoer & Pauline. 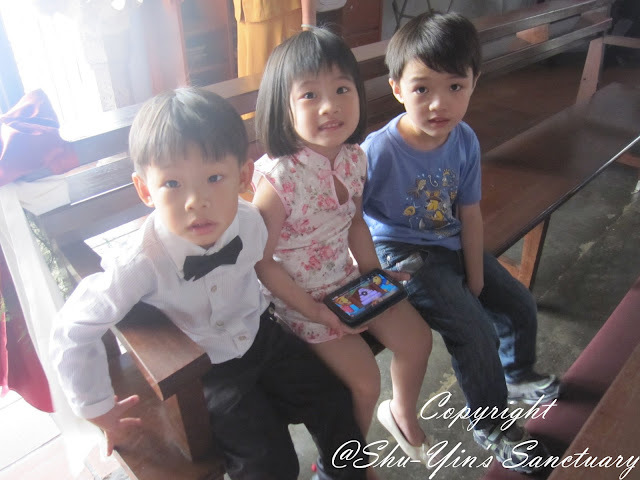 More photos of Shern with his friends. 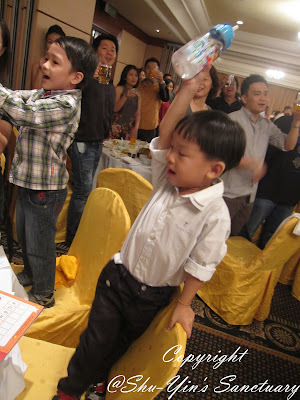 And Shern is a hard-core 'yum seng' fan! 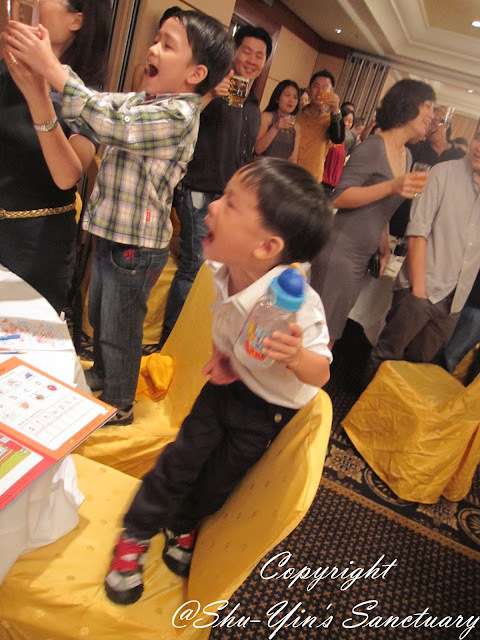 He didn't like the orange cordial there, so he yum seng-ed with his water bottle, and shouted his lungs out! 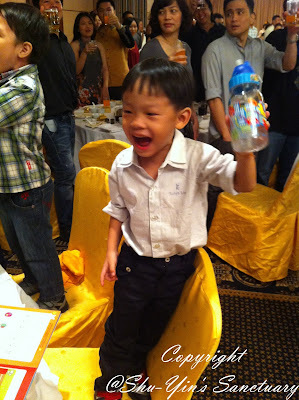 I think Shern had fun that day. 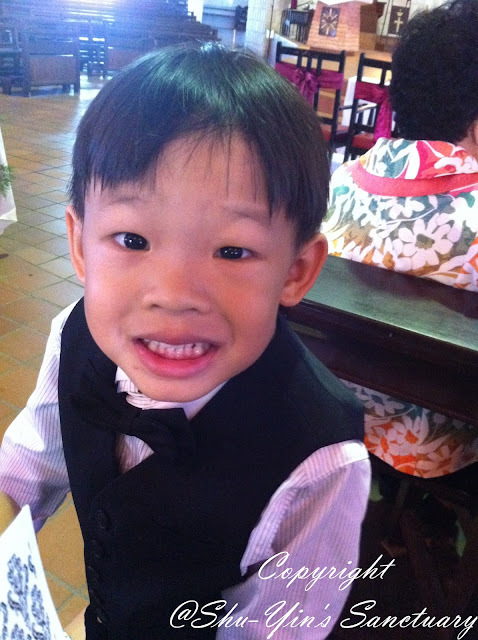 And I'm so proud of my big boy for doing such a great job as the Ring Bearer! Lol. 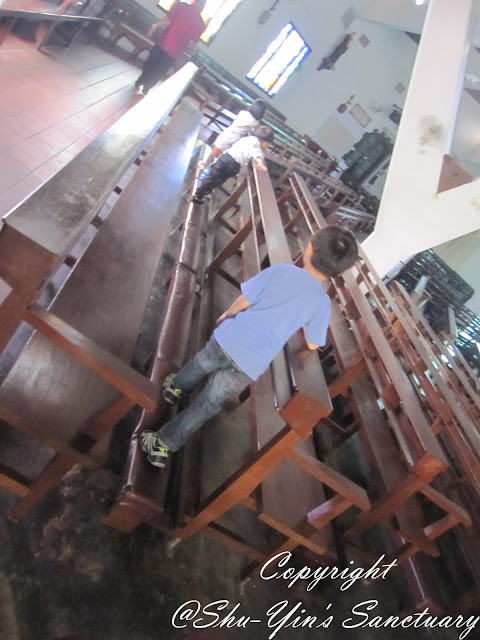 He likes to church but not the sweat. My sweet and innocent boy. 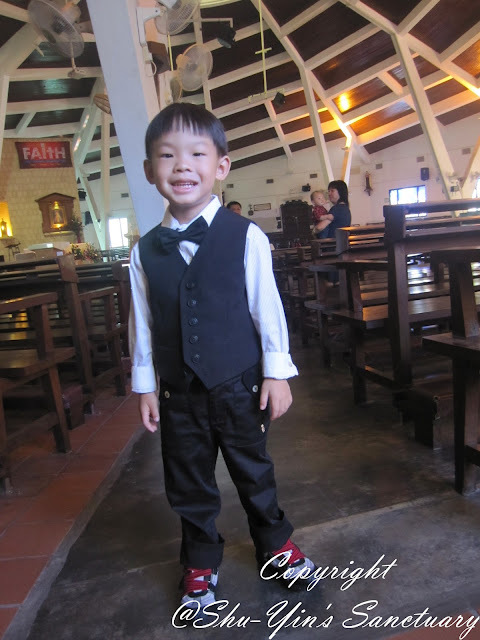 And thank you Chun Hoer & Pauline for asking Shern to be your Ring Bearer. You gave him a most memorable experience!